Welcome to the AVIATION DAY 2015 Web Site! Help spread the word, download the flyer! Distribution is strongly encouraged! Held annually since 2003, Aviation Day is an opportunity for the public to come out to the Vero Beach Municipal Airport for a little "Airplane Time". Over the years, Aviation Day has grown from a little "fly in" to a successful family oriented community event. Every year we welcome several thousand visitors, aviation minded friends and future aviators. Approximately 40 aircraft of all types are planned to be on display. The star of the show will be EAA´s B-17 "Aluminum Overcast", which will be open for ground tours. For more information and to reserve a flight on the B-17, visit www.B17.org or call 800-359-6217. To get an idea of what to expect on Aviation Day, browse through our Photos section. There are also several videos on YouTube. 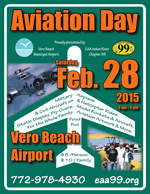 Search for "Aviation Day Vero Beach". Check back frequently als we will update this site as more information becomes available (photos on this page are from previous events). In addition to checking out the static display aircraft on the ramp, visitors can try their hand at EAA Chapter 99´s Flight Simulators, which are set up with the latest version of MS Flight Simulator X with add-ons and accessories. A radio-controlled model aircraft simulator will also be availabe. Biplane rides are available for $ 60 per person (the cockpit can seat four persons). Helicopter rides will be offered for $ 30 per passenger (helicopter can take three persons). Aviation merchandise will also be on site. Stop by our tent and get to know those crazy plane nuts who love to share their enthusiasm about flying and are looking forward to showing you their project. Food and drinks will be available in the display area, provided by C.J. Cannon´s Restaurant. Enter through the terminal of Vero Beach Municipal Airport on 3400 Cherokee Drive (map link). Plenty of free parking is available. Handicapped parking in first row. Visit the exhibits in the terminal (free) or come out on the ramp (admission) to see the airplanes. KVRB is open during the event. Check www.airnav.com/airport/KVRB. For questions about the airport call 772-978-4930. Admission: $5 per person, $10 per family. Anyone flying in will be admitted for free! By checking out the photoalbum for reports and photos of past Aviation Days, you probably get the best idea what Aviation Day is all about! The members of EAA Chapter 99 and Vero Beach Airport are looking forward to welcoming you at Aviation Day 2015 and sharing a day of aviation fun with you. Copyright © 2004-2016 EAA Chapter 99 - SP - All rights reserved.